(U//FOUO) The Central California Intelligence Center (CCIC)/Sacramento Regional Threat Assessment Center (RTAC) has prepared the following Situational Information Report on exploding targets, a commercially available binary explosive agent, to provide law enforcement and public safety officials with a better understanding of the potential public safety risks involving its use. 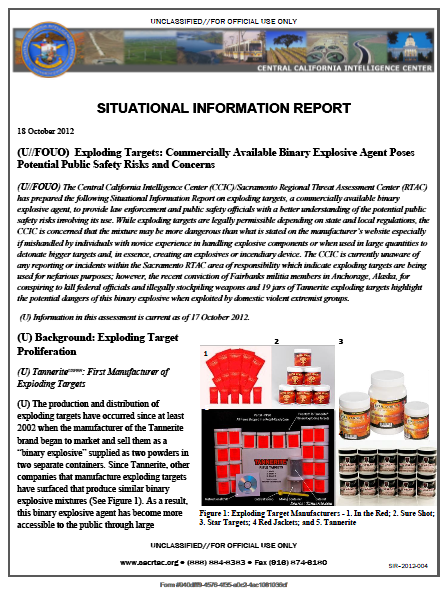 While exploding targets are legally permissible depending on state and local regulations, the CCIC is concerned that the mixture may be more dangerous than what is stated on the manufacturer’s website especially if mishandled by individuals with novice experience in handling explosive components or when used in large quantities to detonate bigger targets and, in essence, creating an explosives or incendiary device. The CCIC is currently unaware of any reporting or incidents within the Sacramento RTAC area of responsibility which indicate exploding targets are being used for nefarious purposes; however, the recent conviction of Fairbanks militia members in Anchorage, Alaska, for conspiring to kill federal officials and illegally stockpiling weapons and 19 jars of Tannerite exploding targets highlight the potential dangers of this binary explosive when exploited by domestic violent extremist groups. (U) The production and distribution of exploding targets have occurred since at least 2002 when the manufacturer of the Tannerite brand began to market and sell them as a “binary explosive” supplied as two powders in two separate containers. Since Tannerite, other companies that manufacture exploding targets have surfaced that produce similar binary explosive mixtures (See Figure 1). As a result, this binary explosive agent has become more accessible to the public through large stockpiles available at local gun shops, and outdoor sport stores as well as online purchase via the Internet. (U) Since the components are not categorized as an explosive agent until mixed, the binary exploding target package can be purchased and shipped in the United States without an explosives manufacturing license. (U//FOUO) The manufacturers provide both guidance and knowledge to consumers through their website regarding the components of exploding targets and the ability to purchase this product in the United States without an explosives manufacturing license which suggests a familiarity with federal laws that govern the manufacturing and shipment of binary explosives but are likely unfamiliar with state and local ordinances that regulate its use. The CCIC is concerned the manufacturer may be exploiting certain loop holes in how federal laws regulate binary explosives and using this knowledge for commercial gain, but minimizing the dangers of exploding targets and misleading its consumers with its “designed to be safe” pronouncement.